Yep: those were the things that were keeping me occupied for the last 3.5 months of the year. 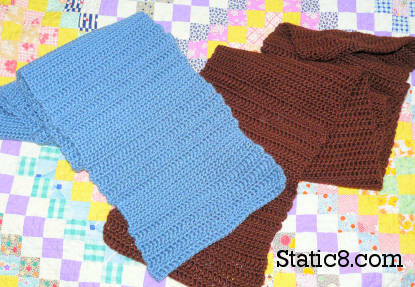 Scarves for Mom, Gram, Brother and Dad! I had actually started the black scarf in the middle in Sept. The pattern looked fun and the directions said "Easy" and I was going to whip up four of these scarves, and be so happy with my homemade gifts that were finished with months to spare! 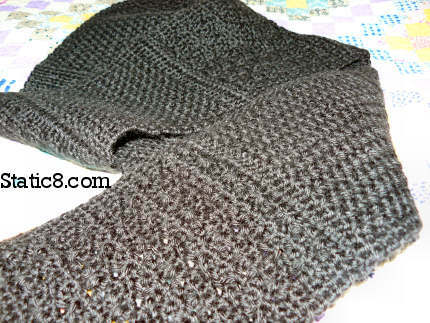 But, yeah, it got done eventually after being abandoned a couple times to make the two Easy Scarves. And then my pride and joy! laughs... my xmas tree scarf. 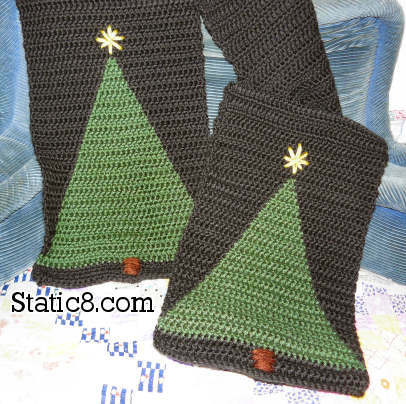 Black scarf with a green triangle at both ends... the brown trunk and yellow star are sewn in. I was going to sew some blue garland and some white snowflakes... but I quickly discovered how much I hate embroidery! It's Not fun At All! But still, I love that scarf! I made it! And I designed it! I am Brilliant! Also Brilliant: My Friend LaLooFah... Happy Birthday!! !